Geography, cost and a new attitude. Those three ingredients have put Tucson in the national spotlight for companies looking for markets with distribution hubs, a new report shows. Tucson is one of the least expensive cities in which to operate a distribution warehouse and its proximity to key U.S. and international markets makes it attractive to companies looking to expand or relocate, says the report by The Boyd Co. Inc. of Princeton, N.J.
And, as the nation continues its crawl out of the recession, warehouse operations are no longer viewed as unappealing, John Boyd Jr., principal of the location-consulting company, said during a recent visit to Tucson. "It used to be that many communities were resistant to new warehousing projects," he said in his report. "Now, however, communities are actively courting logistics industries because the economic benefits are clear and compelling." The two biggest benefits of landing warehouse operations are jobs and property-tax revenue, Boyd said. It is also an industry that cannot be outsourced and is growing as shoppers patronize online retailers vs. hitting the malls. The report's finding validates efforts by the public and private sector to recruit the industry, officials said. Southern Arizona's economic development agency, Tucson Regional Economic Opportunities, Inc. hails logistics as one of the key industries for future job growth. "The Boyd Co. study echoes the analysis TREO conducted for both the Economic Blueprint and the Southern Arizona Transportation & Logistics Strategy several years ago," said Laura Shaw, TREO's senior vice president for marketing and communications. "In addition to competitive costs, Tucson's strategic location as a gateway to Mexico and proximity to California gives us further competitive advantages for business growth." Operators of the Port of Tucson have believed in the region's capacity as a logistics hub for years. The 17-year-old distribution and warehouse operation added intermodal service in 2004 and international container service this year. The port on the city's southeast side last year added 26,000 feet of rail track, said Mike Levin, the port's executive vice president for marketing. Whether a company imports, exports or distributes within the U.S., the location offers access to interstates 19, 10 and 8, as well as to the Union Pacific's rail line. Expansion in the size and capabilities of the Port of Guaymas in Sonora offers another opportunity for Tucson to establish itself as a distribution point for imports and exports. Last year the seaport signed a contract with Switzerland-based Mediterranean Shipping Co. to receive and ship container cargo and is currently undergoing a massive expansion into the bay with neighboring Empalme, said Guillermo Von Borstel, the port's marketing director. The Port of Tucson now has approval from Union Pacific to service international ocean containers via Long Beach and Los Angeles ports into Tucson twice a week. It will also send containers from Tucson to the California ports five days a week, said Stefan Baumann, the port's director of business development. Until now, ocean containers bound for Southern Arizona or Sonora had to be trucked directly to the importer. The empty containers were then returned by truck to the California ports. For an export shipment, the empty container was trucked to Arizona or Sonora and returned to Long Beach or Los Angeles loaded. 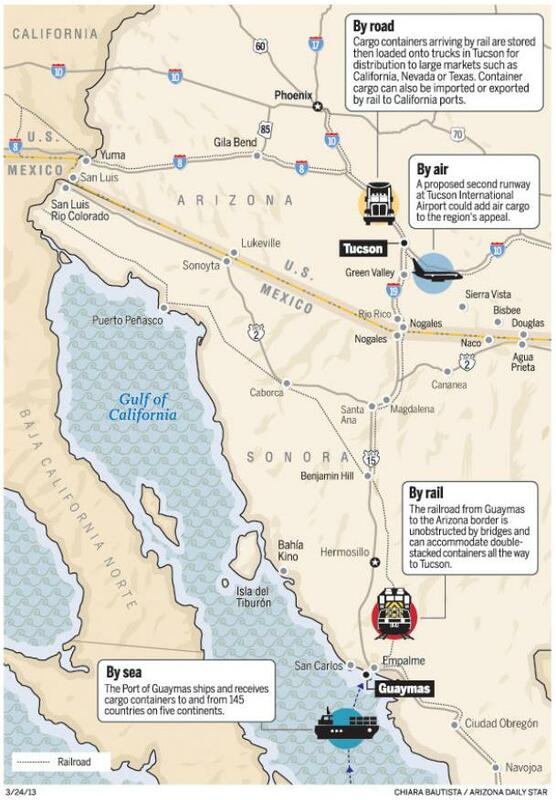 The approved rail solution eliminates nearly 50,000 annual one-way road trips between Tucson and the California ports. "This is a major milestone for the region," Baumann said. For companies looking to tighten budgets, Boyd advises locating distribution centers close to rail ramps. And, since California has a large consumer base, locating in a neighboring state gives companies access to the market without having to pay the high regulatory costs of shipping from within the state. Boyd's report characterizes California's business climate as "difficult." "A study commissioned by California Trucking Association found that California's new Low Carbon Fuel Standard will likely raise the retail price of California diesel fuel by up to 50 percent - to $6.69 per gallon by 2020," the report said. Other factors that put the Tucson region on the radar for site selectors is the logistics-related courses offered by Pima Community College, from truck driving to supply-chain management, Boyd said. "That and relative insulation from natural disasters are becoming issues in corporate board rooms," he said. Pima County Administrator Chuck Huckelberry sees the potential and is advocating for investment in new highways and Tucson International Airport to make the area more appealing to the industry. "We have the availability of significant land and air cargo capabilities," Huckelberry said. "The report confirms what we thought: We're competitive and could be even more competitive." His plan calls for a new roadway to connect two University of Arizona research parks, Davis-Monthan Air Force Base, the Arizona Air National Guard, Tucson International Airport and the Port of Tucson. The Hughes Access Road relocation would become part of a parkway, along with Old Vail Connection Road, to form a new state highway from Interstate 10 at Rita Road to Nogales Highway near the airport. A future project would connect the parkway to Interstate 19, likely though Sahuarita and add a second runway to TIA for air cargo. Huckelberry has seen efforts to create a logistics hub in Tucson falter over the years, but believes Sonora's growing economy and improved infrastructure are helping make the case for nurturing the industry. "A key ingredient that had been missing was for Mexico to emerge economically," he said. "We can pull off a new major employment sector. It's a natural." More than 150 companies in the Tucson area specialize in logistics, from warehouse and shipping operations to the intermodal facility. Boyd applauded the efforts in Tucson and said that if Congress approves another round of stimulus spending, the money should be focused on infrastructure. "The new competition is small, smart markets," Boyd said. "Tucson needs to stay on the radar screen." Distribution and warehousing companies looking to expand or relocate are eyeing cities with the lowest annual operating costs that are close to large markets, such as California and Texas. The following comparison is based on a 500,000-square-foot distribution center with 175 hourly workers. Source: The Boyd Company Inc.
For more than a decade, the city of Tucson operated Puerto Nuevo, a project to create a site where trade goods from Mexico could be received and stored, then shipped by rail or truck throughout the country. The effort folded in 2007 and the city handed the project to Tucson Regional Economic Opportunities Inc. Contact reporter Gabriela Rico at grico@azstarnet.com or 573-4232. Editor's Notes: The above article by Gabriela Rico was first published in the Arizona Daily Star, March 24, 2013 entitled, Tucson looking for a future as a distribution hub. Contact us for warehouse and distribution space at Century Park, located at the Port of Tucson.